Richard now creates many programs each week, two of which are usually with Tracey. There is a richly varied, and detailed amount of content in these programs, some of which are freely available to the public, others of which are Members Only. Click links below to watch and listen. Monday at 8 p.m. Eastern Time. Occasional weeks off. Airing every week since 2012. 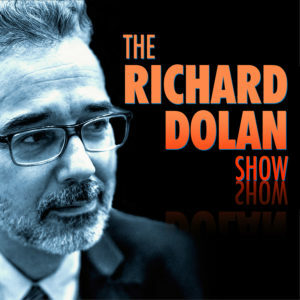 For many years it served mainly as a personal podcast featuring Richard’s research and philosophy. Today it is interview-focused, with fascinating guests discussing the things that matter in this world. In two parts: Part One is available to all, listen to Part Two by becoming a Member. Tuesday 8 p.m. Eastern Time. Richard and Tracey’s popular weekly livestream program airing on Youtube every week. For roughly 90 minutes, we discuss UFOs, science, future tech, remote viewing, and all kinds of anomalous fascination. We also answer live questions from the chatroom. All episodes available on our Youtube Channel. 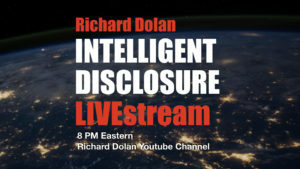 Richard’s weekly livestream program that picks up where the old Richard Dolan Show left off — one on one with Richard as he discusses the things that matter to him from UFOs to politics, science, and beyond. All episodes available on our Youtube Channel. Richard’s weekly Members-Only video podcast (usually one hour long) in which he recaps the important events of the week and talks about anything else on his mind, often spontaneously. Where Richard and Tracey talk about anything, anywhere, any time, however they like to do it. Ultimate behind-the-scenes discussions. Members only.